1) Open the call sheet you wish to publish so that your are in editing view. At the top of the page, click on “2 - Publish” to leave the building step and move to the publishing step. There are a few handy “preset” buttons above the cast and crew sections. 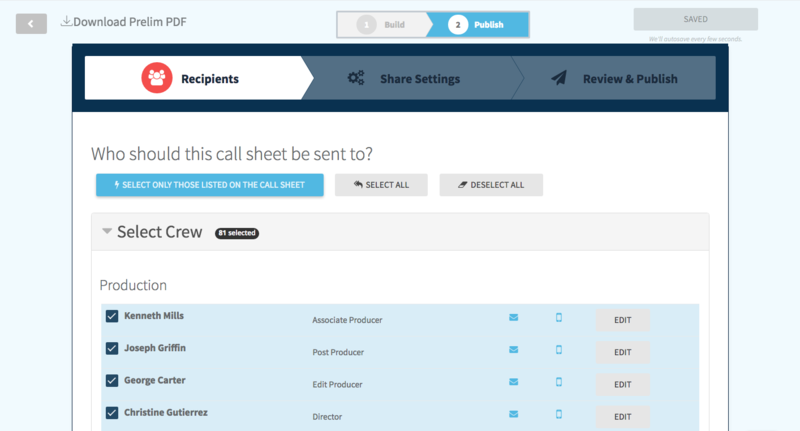 “Select Only Those Listed on the Call Sheet” - Clicking this button is a great way to quickly select everyone who is on the call sheet. It will automatically select the crew members that are listed under the crew call section on the back of the call sheet and any cast members that are called. Any people not shown in either of these spots will be deselected. “Select All” - This will select everyone (cast & crew), regardless of whether or not they appear on the call sheet. “Deselect All” - This will deselect everyone (cast & crew). If a person’s name is grayed out and not selectable, it is because they do not have contact info (email or phone) and thus can’t be sent the call sheet. To resolve this, click the edit button to the far right of that person’s row and add an email or phone number. Once you’ve selected the recipients, you’re ready to customize your message settings.